SKAGIT CASTING requires a line with a very short heavy head that propels heavy sink tips and big flies great distances with a very short casting stroke. This casting method is easy for novice or experienced casters to learn. 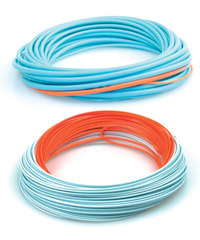 When casting these lines the total head length should be matched to the rod; the total head length including the sink tip should be no more than 3 -31/2 times the length of the rod, with many anglers now prefering a setup somewhere just below this length. Their mass distribution allows for easy, sustained-anchor casts with sink tips and weighted flies. EASY CASTING, ULTRA-POWERFUL HEADS for big flies and sink tips.  Ultra-low stretch core for the best in casting and fishing sensitivity.  Complete series of heads with varying lengths and small size increments. 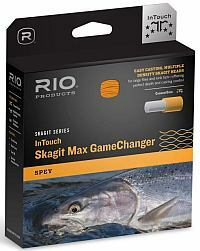 RIO Skagit Max heads cast large flies and the fastest of sinking tips with exceptional ease. The unique weight distribution deeply loads rods for long, powerful casts, while the subtle taper design generates smooth, easy loops and long, long distances. All Skagit heads are built on an ultra-low stretch core for the maximum in casting and fishing sensitivity. 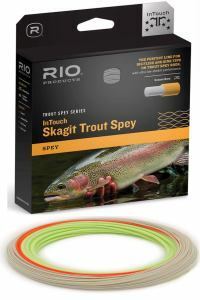 The perfect line for big flies and sink tips on trout spey rods, with ultra-low stretch performance.  Includes a balanced set of sink tips and shooting line in a ready-to-go package. 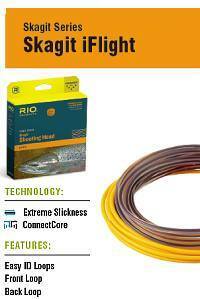 RIOs Skagit Max VersiTip is a ready-to-go line system for the two handed angler. 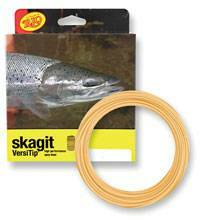 Each package includes a Skagit Max shooting head that is designed to cast large flies and fast sinking tips with ease. 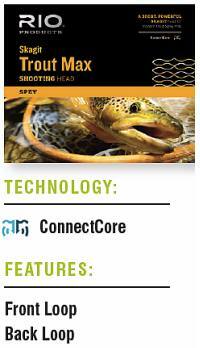 Also included is a balanced set of tips to cover changing fishing conditions and an appropriately sized shooting line. Each head is built on an ultra-low stretch core for the maximum in casting and fishing sensitivity.